In trying to cut the amount of butter in my diet I have started using coconut oil in recipes such as muffins. Coconut oil has many health benefits since the fat in coconut is different than the fat in other oils. Along with the benefits being discovered in using virgin coconut oil using it in baked goods adds a light coconut flavor and a nice texture. The coconut oil and coconut milk used in this recipe gives a great flavor combination with the blackberries and cinnamon. These muffins come out very light and crumbly. Place rack in the center of the oven. Preheat an oven to 375°F/190°C/Gas Mark 5. Prepare 15 standard muffin cups by lining with foil muffin cups or use silicone muffin cups. To make the topping, in a small bowl, stir together the sugar, flour, cinnamon and chopped pecans. Stir in the melted coconut oil until the mixture is crumbly. Set aside. To make the muffins, in a bowl, sift together the flour, sugar, baking powder, baking soda, cinnamon and salt. In a small bowl add egg, melted coconut oil and buttermilk (or coconut milk). Whisk to combine. Make a well in the center of the dry ingredients and add the egg, melted coconut oil and buttermilk mixture. Stir just until evenly moistened. The batter will be thick and slightly lumpy. Do not beat, it will make tough muffins. Spoon a tablespoon of batter to cover the bottom of the muffin cups. Place several berries, depending on the size, on top of the layer of batter. Cover the berries with more batter to 3/4 full in the cups. 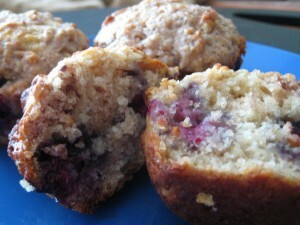 Using your fingers sprinkle the crumb topping evenly over the muffins. Bake until the muffins are golden, dry and springy to the touch, and a toothpick inserted into the center comes out clean, 25 to 30 minutes. Transfer the pan to a wire rack and let cool for 10 minutes.